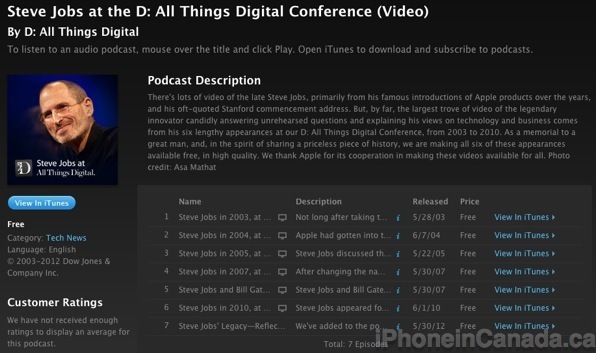 AllThingsD has just uploaded all the videos and audio of Steve Jobs appearances at D from 2003-2010 in iTunes, available for free. These are the priceless videos where Jobs answers interview questions candidly and script-free. There’s lots of video of the late Steve Jobs, primarily from his famous introductions of Apple products over the years, and his oft-quoted Stanford commencement address. But, by far, the largest trove of video of the legendary innovator candidly answering unrehearsed questions and explaining his views on technology and business comes from his six lengthy appearances at our D: All Things Digital Conference, from 2003 to 2010. As a memorial to a great man, and, in the spirit of sharing a priceless piece of history, we are making all six of these appearances available free, in high quality. We thank Apple for its cooperation in making these videos available for all. Apple CEO Tim Cook headlined the start of D10 yesterday and provided a fantastic interview for all. Great move on the part of All Things D. Just go and download these now in iTunes. Click here for the video, and here for the audio. Update 1: The Steve Jobs and Bill Gates interview was actually 90 minutes long, but the updated one is only 8 minutes long. @i0livier notes you can still listen to the full audio of the entire interview here, via Google’s cache. 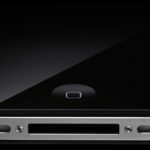 Does A New Job Listing Hint At Apple Replacing Its iDevice Dock Connector?